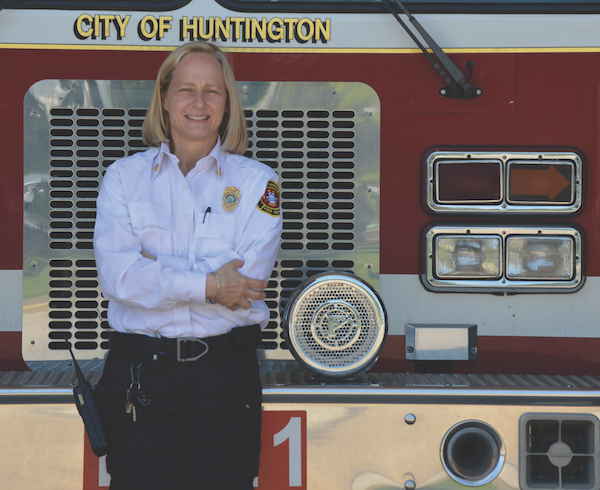 Rader stands in front of a Huntington fire engine. The Fighting Addiction club will present a student led panel discussion on the effects of addiction at 7 p.m. April 5 in the Don Morris Room. Among the panelists are Jan Rader, Huntington’s fire chief, Chris White, a history professor at Marshall University who teaches a class about the drug wars, Richard Egleton, a pharmacologist, and Bernard Slater, a recovering drug addict. Fighting Addiction members said the main goal of their organization is to educate the public about the drug addiction issue, and they said they hope the panel will be informative, as it is their biggest event of the semester. Skidmore and Mouhammed Sakkal worked together to create the group last fall. Fighting Addiction has more plans for the future as well, members said, including a philanthropy dinner with Recovery Point, a rehabilitation center in Huntington and supporting elementary school students who have family members dealing with addiction. “We had this idea to support families of recovering drug abusers by targeting elementary age kids; we just want to support the families too,” Taylor Adkins, junior biology major and Fighting Addiction member, said. Sakkal said there is no other program in the community similar to what they are doing. Members said they were partially inspired to create the group because they see the effects of drug addiction everywhere.